There’s no denying that IG shopping is at an all-time high; the countless stylish local brands popping out of nowhere is proof. Armed with curated feeds and friendly-priced apparel, these are ten hot brands you need to check out. Looking for jeans, tops, dresses, and rompers with an edge? Whatever you need to look chic on the streets, you can find here. 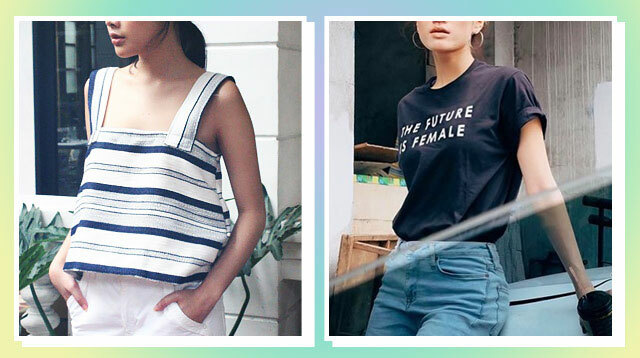 When you need to flaunt a little girl power (or when you're in the mood to make a statement), Project Express has tees that can instantly add oomph to lazy day dressing. A thigh-high slit here and a cropped top there: Your hubadera self can flaunt her assets in Undo’s pieces that can totally be mixed and matched with your existing closet staples. This brand is all about allowing the ultra femme to indulge in all things ruffly and printed, one girly piece at a time. Say hello to your new closet staples! Dress them up or down, there is no wrong way to wear their versatile pieces. The cool blue hue (that looks great on anyone!) on a variety of styles? No wonder even Heart Evangelista is fond of the brand. Tweaking basic silhouettes to give them that Cali girl chill vibe, Anika is for the classy lady who appreciates beauty in simplicity. Full of clean, uncomplicated pieces you can take from work to play and from the city to the beach. We’re sure you’ve already heard of this brand—it’s known to be a go-to place for last minute formalwear needs. But lately, they’ve been serving up an array of frocks that could tickle any tropical lady’s fancy. Now on their 10th collection, Neon Island continues to give millennials both what they want and what they never thought they'd need.